Does anyone have the instructions for this game that they could scan or photograph for me? I bought mine used without box and instructions. "Destroy or be destroyed" as you strategize every move against your opponent within the battle zone! 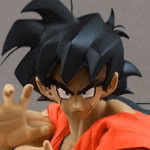 You command your Dragon Ball Z® warriors to hunt the enemy and simultaneously fend for safety from calculated attacks! Play against an opponent or choose single play option on the Dragon Ball Z® galactic grid. Both players' moves are calculated with a step-by-step objective to seek and annihilate the opponent. The last warrior standing from either fleet wins! Awesome sound effects add further dimension to this strategic game of search and destroy! Battle Strategy includes two Color FX-2 LCD screens for score keeping and play-by-play animation. Folds for easy storage & carrying so you can play Battle Strategy anywhere in the Galaxy! No luck on finding online instructions for it. I believe I have it but where it is at the moment I have no idea. If I find it in my travels I'll send you some pics. You would think that there would be a comprehensive board game rules encyclopedia somewhere on the internet. How do we not have this yet in 2017? There mostly is a site like that, but it lacks info for this game! The guy who thought he had the instructions, who contacted me on Facebook, said that he checked his box and the instructions were missing. Carnage, can you please find yours and post or send me some pictures of each page when you get a chance? Perhaps this seller could help you. His appears to be new but opened. lol oops! should have read a little more. Freakin' Pilaf went from stealing the dragonballs to stealing all the instructions from this game! Anybody find the instructions for this...? Someone on ebay was kind enough to email me some low res scans of the instructions!!! I cleaned them up in Photoshop and enlarged them, and I hosted the images on the DBF Facebook. Eventually I'll host them another place permanently. Glad to see you finally found them!!! Had you managed to play correctly anyways or were you holding out 'til you finally got the instructions? I haven't yet gotten to play it with the instructions yet. My girlfriend has been out of town or we had other plans for the weekends. I ordered some metal dowel rods so I could hand-make new game pieces and the pegs would fit the holes on the game board. I hope the original bases being clear plastic isn't important to the electronic portion of the game, because the replacement pieces I'm going to have to make will end up being opaque and made of apoxie clay (or popscicle sticks or craft foam) and metal dowel rods. Playing with the figures on the bases makes placing the red and yellow marker things difficult, so I don't want to play with them attached. So the new bases I make won't have a place for the figures to attach.